Historians and theologians alike have long recognized that at the heart of the sixteenth-century Protestant Reformation were five declarations (or "solas") that distinguished the movement from other expressions of the Christian faith. 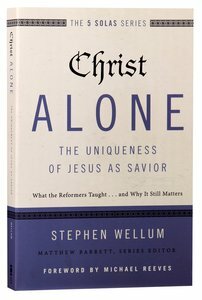 In Christ Alone, Stephen Wellum considers Christ's singular uniqueness and significance biblically, historically, and today, in our pluralistic and postmodern age. He examines the historical roots of the doctrine, especially in the Reformation era, and then shows how the uniqueness of Christ has come under specific attack today. Then, he walks us through the storyline of Scripture, from Christ's unique identity and work as prophet, priest, and king, to the application of his work to believers and our covenantal union with him to show that apart from Christ there is no salvation. Wellum shows that we must recover a robust biblical and theological doctrine of Christ's person and work in the face of today's challenges and explains why a fresh appraisal of the Reformation understanding of Christ alone is needed today. About "Christ Alone - the Uniqueness of Jesus as Savior (The Five Solas Series)"
:each Volume Will Be Structured Into Three Parts And Will Be Approximately 70,000-80,000 Words In Length.1.sola______ In Historical Perspective.part 1 Of Each Volume Seeks To Take The Reader Back To The Sixteenth Century, Providing The Reader With The Historical Background To The Sola In Focus. 2.sola______ In Biblical And Theological Perspective.part 2 Moves From The Historical To The Biblical, Seeking To Defend The Sola In Focus Both Biblically And Theologically. 3.sola______ In Light Of Contemporary Challenges. Part 3 Addresses New Challenges To The Sola In Focus. The Purpose Of This Final Section Is Not Merely To Answer Contemporary Challenges, But To Show The Relevancy Of Reformation Theology Today. Thomas Schreiner examines the historical and biblical roots of the doctrine of justification. He discusses whether justification is transformative or forensic and introduces readers to some of the contemporary challenges to the Reformation teaching of 'sola fide', particularly the new perspective on Paul.